The Tompkins County Department of Recycling and Materials Management is partnering with Challenge Workforce Solutions to offer a free Confidential Document Shred Day for all Tompkins County residents. The Legislature’s Public Safety Committee, after discussion, recommended that the Legislature take a stand in support of marijuana legalization in New York State. The measure won support by a unanimous 5-0 margin. Now that Election Day is over, those political campaign yard signs - whether made of plastic film or Coroplast® - can be recycled in Tompkins County. The County’s Department of Planning and Sustainability is preparing an update of the “2020 Strategic Tourism Plan.” This plan will guide future policies and investments relating to tourism in Tompkins County. Both Tompkins County Director of Assessment Jay Franklin and Assistant Director Irene Kehoe were recognized this month by their fellow assessment professionals in New York State. 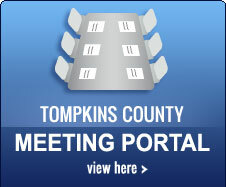 The Tompkins County Legislature is seeking members to serve on the Tompkins County Human Rights Commission.